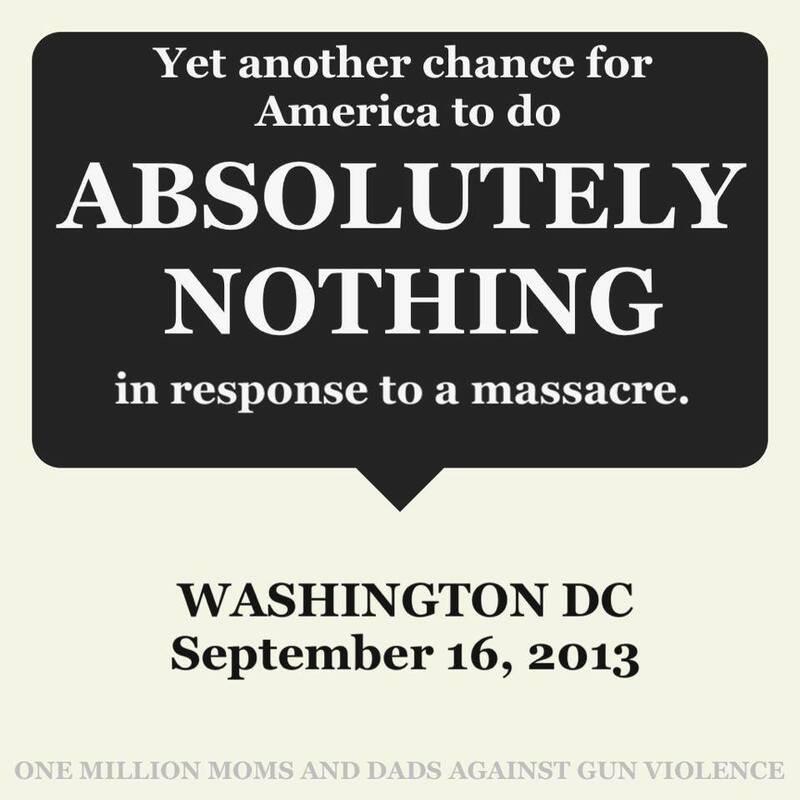 Common Gunsense A blog to advocate for sensible gun legislation: When is the next mass shooting? When is the next mass shooting? We need to ask some very serious questions after yet one more mass shooting in our country. What is wrong with us? There should be absolutely no delay for our Congress to get to work and pass the background check bills languishing in both houses.Yesterday, I was teary eyed for most of the day. First because I attended the funeral of a friend and former instructor of mine who was well loved by many. He died too young from Acute Leukemia. We weren't ready for him to leave us. 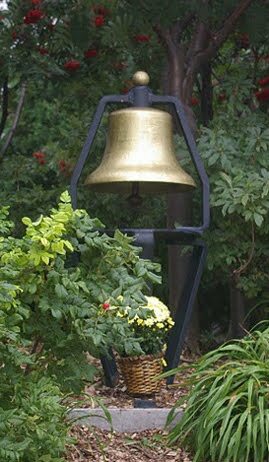 The funeral was so poignant because of the special music, sung by friends of mine, and the reading of poetry written by a friend who spent many days with him as he was dying. His was a life well-lived. More than 50 mass shootings have occurred during the last four years, totaling more than one per month, according to a study compiled by Mayors Against Illegal Guns. An average of six people died at each one. But gun violence persists in the country even beyond mass rampages on a day to day basis. More than 70 people were shot–12 of them killed–in Chicago this year during the Fourth of July weekend. And fifteen-year-old Hadiya Pendleton was shot in the same city a week after performing with her marching band at President Obama’s second inauguration earlier this year. So, I wondered to myself and out loud, will this be the one that changes our national conversation about gun violence? Will this be the shooting that impels our Congress to act? Will this be the shooting that was just one too many? Or will it take one more, or two more? What is the limit of our patience and sadness? The Chief Medical Officer of the Trauma Center at the Washington hospital where some of the victims were taken spoke out about what is wrong with our country. Are we having another "discussion" about gun safety in America? If so, where will it lead this time? Nowhere as usual? Or will we actually have had enough of the news stories about mass shooters who shouldn't have guns in the first place mowing down a whole lot of innocent victims. We have now learned that the shooter had had several incidents that should have been a red flag and made it difficult for him to get a gun. But not in America. A misdemeanor while using a gun is not a disqualifier for someone to buy a gun in this country. He was separated from the Navy. Why did have security clearance to get into the Navy Yard? The shooter, Aaron Alexis, was a "law abiding" gun permit holder in spite of the fact that he has been involved in several weapons violations. How does this happen? If this isn't enough to get the attention of the nation, I don't know what is. But you may remember that Texas recently lowered the requirements to get a permit to carry a gun. Seriously. This is not OK.We have some problems here that need to be addressed and addressed very soon before we have another mass shooting, which we will inevitably. Meanwhile, back at the NRA, here is what one of most powerful national lobbying group is up to in order to fight against common sense gun laws. A new report released by the Violence Policy Center entitled Blood Money II: How Gun Industry Dollars Fund the NRA (pdf) disproves the NRA’s claim that it receives no money from the gun industry. The NRA has received at least $1 million from the Freedom Group, which manufactured the Bushmaster assault weapon used in the December 2013 mass-shooting at Sandy Hook Elementary in Newtown, Connecticut. Another inductee, according to the VPC, was Smith & Wesson, which manufactured the assault weapon that was used in the July 2012 shooting in Aurora, Colorado. This is not OK on so many levels. Does anyone remember what happened in Newtown, Connecticut on 12/14 of last year? I do. Does anyone remember all of the other mass shootings in America? I do. Does anyone truly realize how the news of a loved one being shot to death affects the family members and friends of the victims? I do. Does anyone believe that we cannot do something about this daily carnage? I don't think so. We can but we won't and we aren't. People should be able to go to work without fear of being shot by a disgruntled employee or former employee. Kids should be able to go to school and come home again at the end of the day without a shooter barging into their school with an assault rifle and mowing down 7 year olds and teachers. People should be able to gather in public places without a deranged man attempting to assassinate a sitting Congress member and taking the lives of too many innocent bystanders in the assault. People should be able to gather together to celebrate their religion without being massacred by someone who hates their religious beliefs. What will it take to get this right? What will it take for our Congress members to get this? What will it take for us to come together as a country to solve a very serious problem that is displaying itself on a regular basis all over the media in our country and world-wide? For what we are doing right now is not working. It's time for a change. Let's get to work. 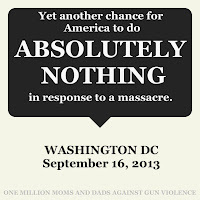 Thanks to my friends at One Million Moms and Dads Against Gun Violence for providing the graphic at the top. The former Navy reservist identified by authorities as the gunman in the massacre at the Washington Navy Yard was cited at least eight times during his Navy career for misconduct, officials said Tuesday, including insubordination, disorderly conduct and multiple excessive absences from work. The official clarified that the service had originally sought to kick out Alexis with a general discharge because of his pattern of misconduct while in uniform, in addition to his arrest by Texas authorities in 2010 for shooting a gun into his neighbor’s apartment. But those proceedings were moving slowly, and it was unclear whether the Navy had sufficient cause to approve a general discharge, the official said. As a result, when Alexis applied on his own to leave the Navy in early 2011 with an honorable discharge, the service granted his request, the official said. Is this a man who should have been able to legally purchase a gun and get a permit to carry one? Is this a man who should have been able to walk onto that base? I'm just asking and I think we all know the answer. But we are doing nothing about it. "Over on Reddit, the Guns Are Cool community has compiled a list of every mass shooting in the United States this year. The moderators of the subreddit, which doesn't actually appear to be of the belief that guns are cool, use an expanded definition of mass shooting, listing every event in which "four or more people [including the shooter] are shot in a spree." Under the Reddit definition, a shooting spree that wounds at least four people, but doesn't kill them, is still a mass shooting. Including Monday's mass shooting, the Reddit list for 2013 is nearing 250 incidents. That's an average of one mass shooting almost every day." Of course, if anything, it is becoming easier for these events to happen due to lax gun laws. As for the "gun free zone" comment--that is just plain off ridiculous: especially in this case. The Naval Criminal Investigative Service (NCIS) has its headquarters in the Navy yard. Also, if you look at the pictures of people evacuating the area, you will see them with their hands empty and visible to ensure they are unarmed. Now, what do you think would happen to someone who was armed and not a part of the LE force? Would they give him an award? Yeah, he would get a Darwin Award. The reportage of this mess has been just that, a mess, with it being very hard to trust the media especially the likes of Piers Morgan, who was so quick to call the shooter's weapon an AR-15. The media in this country sickens me - instead of reporting actual and honest information, they report whatever they think they know and retract hours and days later. But I digress - this mess is exactly WHY we need to look to something other than government to answer our questions. There's no reason whatsoever that Alexis should have been able to bring a shotgun (again, not an AR15) onto the base. I've been to bases as a civilian and as a contractor - never once was my vehicle not searched. For another, Alexis' coworkers KNEW he was mentally defective - hearing voices, talking to them and the like. The second this came out, his security clearance should have been yanked and no, Im not interested in his rights - he's on a secure military installation, for god's sake. As a gun owner, especially as one who is vigorously fighting the proposed laws here in MA, I find it absurd, almost to the point of laughable that government is demanding more laws when the background check failed to weed Alexis out, knowing he had not only this mental health issue, but that he'd previously discharged a weapon in a dwelling, shooting through the floor of a neighbor, and previously as well, shooting out tires on a car. Wow. And I'm supposed to buy that government has a solution to this when the NICS system is as pathetic a joke as Mr. Obama's performance in Syria? Really? What we had at the base was a security problem that dates back to Nidal Hassan's terrorist activities. Alexis, like Hassan, was a known threat and the military utterly failed its own personnel by NOT doing anything. His clearance should have been yanked, he should have never been able to set foot on that installation, yet incompetence, ignorance, apathy and miscommunication - all hallmarks of our military and intelligence apparatus these days, prevailed, resulting in several dead. I'm fighting hard every day to make a positive image for gun owners and to protect the rights we have from undue requirements that make exercising our civil rights a challenge. Alexis does not represent me, does not represent the people I work for and most certainly should not be held up as a poster child for more gun control. He's a poster child for more security and for taking common sense measures to mental health - ie, he should have been flagged as defective and treated as such. And yes, I am purposefully using the word defective. If these "law abiding" gun owners and permit holders continue to shoot people, it's going to get harder and harder for you. The reason an AR-15 was mentioned is because one was found near the shooter's body. That being the case, it was natural to assume he had used the gun. I think we don't know it all yet. But the media was just reporting what L.E. was reporting. The problem with your reasoning is that our gun background checks should be stricter as well. People like Alexis should not be able to buy a gun or get a permit to carry one. He's a poster child for what's wrong with our country's gun policies as well as a bunch of other things. "Alexis did not face court-martial for any of the offenses, which included an insubordination charge in 2008, a disorderly conduct charge in 2009 and extended unauthorized absences from work on multiple occasions between 2008 and 2010. He did receive administrative punishments three times. The official could not detail the punishments, but discipline for such offenses could range from a loss in pay to reduction in rank." A trial by court-martial is usually reserved for felony level crimes and would result in him becoming a prohibited person. So he was given what is called non-judicial punishment, commonly called an article 15. The punishments permitted under these are based on the rank of the officer bringing the charges. Alexis was charged with insubordination (talking back disrespectfully to a superior), disorderly conduct (judging by his anger issues, most likely picking a fight), and not showing up for work. They didn't kick him out with a general discharge, though if they had, it still wouldn't have had any effect on his ability to purchase the shotgun he used. A general discharge is an administrative action, not a punitive one. These actions are rare in good units, but aren't disqualifiers to own firearms because they aren't felonies. Considering what now happened after all of this, do you think he should have been disqualified from owning a gun and getting a permit to carry? Or do you think people like this have an unfettered right to own a gun no matter what? I think some prosecutor has some spraining to do about how someone who shoots out some tires in a rage doesn't even get charged. Whether he became a prohibited person was determined by the prosecutors involved with the two cases. Seeking mental health services in itself doesn't make him a prohibited person either. I'm sure you meant "splaining" to do. I believe our gun laws require L.E. to give out permits to almost anyone these days. Let's change the laws. Darned iPad auto spell checker. You can tell they never watched I Love Lucy. If he had been convicted of a felony, the purchase and permit wouldn't have occurred. In this case, the permit doesn't really have any bearing either. Even if the issuing state had a reciprocity agreement with DC, which is doubtful, he wouldn't have been allowed to carry lawfully on federal property. Plus, he didnt bring a handgun. The one he used was taken from guards inside the building. Ah. So then our laws,are just fine with you? Should we do nothing or what are your ideas? Do you object to any expanded gun laws? I've read a few recent articles quoting Harry Reid quoting him that he would love to address mental health issues and ownership of firearms. The problem being that we already prohibit those placed in care by a judge. Trying to add to that will have an adverse effect on how readily those who need treatment will seek it due to a fear of ending up on NICS. Especially if there are perceived issues with people getting taken off NICS after treatment. Or perhaps the idea would be that they couldn't get off the list. This would return us to a time when the social stigma of mental health issues kept people from seeking treatment. I think that the next big step in mass shootings will be something on a more local level. Something along the lines of law enforcement's transition from the cordon and plan technique used in Columbine to the new active shooter tactic now being used to good effect. What new laws do you propose that would have prevented this from happening? You have no proof for what you are saying. People who are adjudicated will end up on NICS. What are you saying? If most of the mass shootings have been perpetrated by mentally ill young men, what is your solution? Surely improving the mental health system is key. If people would stop resisting coverage of it under our health care system, perhaps the mentally ill folks who need care would get it. But I have no proof of that either. We have a very serious problem here. Guns and access to them by just about everybody is clearly part of the problem. It is now coming out that strengthening the overall background check system would have served to red flag this guy and maybe not have allowed him clearance for the Navy. He had prior records with guns. Those should be disqualifiers. But they are not. We need to talk about what disqualifies someone from getting a gun. This man was a walking time bomb. He tried to get his assault rifle from a Virginia gun dealer but was denied because he was not a state resident. That mattered and could have kept this from being even worse. We need to look at our system of giving out permits to carry. Strengthening laws may prevent these kind of shootings. I don't have all the answers. You don't have all the answers. But something needs to happen. We can't keep doing this.
" So then our laws,are just fine with you? Should we do nothing or what are your ideas? Do you object to any expanded gun laws?" Which new gun law if no better enforced than the current ones would have been effective? He was obviously in trouble with his mental health and shouldn't have passed a current background check. While we have nothing concrete but the statement of an aquaintance that he had a concealed carry permit he was in DC which doesn't recognize any permits, he was on a military base which doesn't recognize any permits so the permit, if it existed didn't contribute. That said with his record with firearms and mental illness he shouldn't have been able to pass the background check. So a new background check will do what exactly? The FBI says he didn't have an AR15 and the two handguns he had came from security guards. So the assault weapons ban wouldn't have helped. Shotguns are one thing that you and Biden said we could keep. Finally, no, the laws are not just fine with me. There are several that were passed in a blaze of "WE MUST DO SOMETHING!!!!" and should be repealed. Any law which cannot be shown to contribute to actual safety and not just to punishing legal gun owners should be repealed. Thanks Robin. Your comments reflect exactly what's wrong in our country. The fact that some of you ( a minority I might point out) actually believe that something as basic as requiring a background check on all gun sales to attempt to stop some of the shootings and save lives is all about punishing you is the problem. This has nothing to do with you. The myopia of this statement is why we can't get anything done. If you can tell me how requiring you to go through a background check when you buy any gun punishes you, please do. Otherwise stop staying this. It makes absolutely no sense. I thought I'd stop in and see what people are talking about. Surprise....more concern about punishing lawful gun owners and fear of our guns being taken away. Remember when I said until we address the (justified) fears on the gun control agenda of taking away guns, we will not reach any common sense resolution. Well, here it is again!! I don't know why you hesitate to address this. I know it's not the quick solution, and you may even think this is a stupid obstacle, but it still exists and needs to be addressed. You just couldn't resist having another argument, I guess. I am done commenting on your ridiculous and unfounded fears. You guys won't change no matter what we say. If I said the sky was blue, you guys would disagree and say the sky was green.